Could there once have been life on Titan, one of Saturn's moons? Scientists say possibly. Titan is a huge, cold moon that orbits Saturn. Bigger than Pluto and Mercury, its atmosphere is unusually dense with nitrogen. In fact, nitrogen makes up 97 percent of Titan's atmosphere, while methane comprises the other three percent. Titan is the second biggest moon in the Solar System. Conditions on Titan are rough. This moon has harsh environments and cruel temperatures. So how could life possibly exist here? Scientists believe in this possibility because of how similar Titan is to the early, infant Earth. 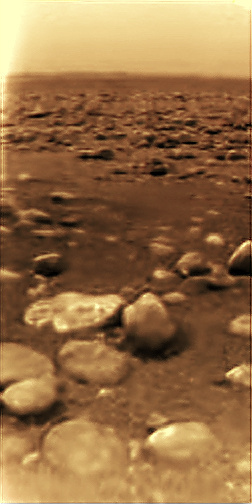 For example, underneath the layers of ice on Titan's surface are seas of liquid methane and a brown sludge called tholin. Greek for mud, tholin is formed when methane and nitrogen mix and are then exposed to cosmic rays similar the Sun's. When dissolved in water, tholin produces a rich mixture of amino acids. Even though it's freezing cold on Titan, scientists are nearly sure that tholin exists here because of a simulation experiment they recently conducted. In this study, researchers put methane in a closed environment and then exposed it to radiation similar to the Sun's. A brown deposit formed, and the researchers believe Titan could be filled with layers of this mush. Even though some still argue that it is too cold on Titan, scientists posit that for life to exist here, a meteor striking this moon may have heated it enough to make it habitable for life. Life on Titan maybe a possibility, although it would be simple, single celled organisms. Ultimately, we may not be alone in our own Solar System as some may have assumed.